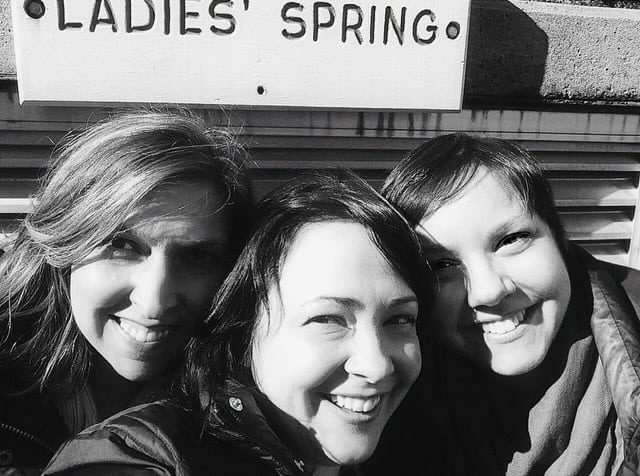 This weekend I went to Berkeley Springs, WV for a girls’ getaway weekend with my two best friends. I feel so blessed to have two best friends who adore one another and the three of us can get along so well without anyone feeling like a third wheel. One friend I met a little over a decade ago at a mutual friend’s work event; we had a mutual love of Malibu and Sprite and late ‘90s hip-hop and went from complete strangers to BFF pretty quickly (in less than a year she was a bridesmaid in our wedding). The other is my sister, and I thank my lucky stars on a daily basis that we ended up in the same family. Though we’ve had our highs and lows as all siblings do, through it all our friendship and love hasn’t wavered. My sister is the event planner of the group. A lover of lists, spreadsheets, and Google, she’s brilliant at finding the best restaurants, lodging, and does plenty of research on what to bring, to wear, to do when we go places. Having been to Berkeley Springs twice before, she had an even better idea on what would make a great one-night mini-vaca. 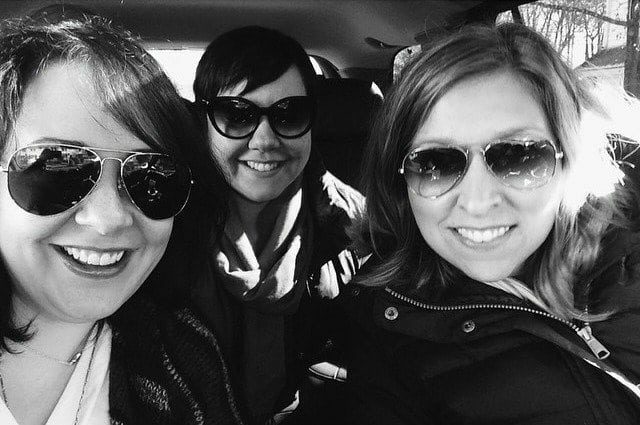 After Karl got home from teaching yoga Saturday morning the three of us got on the road. From the DC area, a trip to Berkeley Springs is less than two hours, no crazy sideroads, a trip you could navigate from scribbles on a Post-it Note. The Country Inn is pretty much the only hotel in Berkeley Springs and it’s charming in its retro way. Since there were three of us, we stayed in a room in their West Inn, which isn’t as charming but quite clean and comfortable. Our room had two queen (not double) beds, and while it didn’t have a minifridge, it had free wifi, cable, bedding that was clearly well laundered, and plenty of room. The main building is right across a small parking lot, connected by a covered walkway. In there was a large and cozy lobby with fireplace, a restaurant and bar, 24-hour coffee and tea, a piano room, gift shop, and a garden with tables that is probably lovely when everything is green and blooming. We arrived in time for our appointments at the Berkeley Springs State Park Bath House. The hot spring is the draw for Berkeley Springs and has been for a long time as we walked past George Washington’s bathtub (a rectangular stone hole in the ground) as we made way to the bath house. There’s two bath houses – one that is more of a group setting and has massages and other treatments, and one that is just individual (you can be in there with up to three friends, but no strangers). We each booked our own bath session; I was led to room #2 which is right off the entryway. A click of the lock on the door and I am in my 30-minute private Roman Bath moment. A blue tiled tub 4’ x 7’ with stairs leading into it; a frosted glass window that let in plenty of light while maintaining privacy. A few hooks on the door and a deck chair to hold my clothing and bag. I brought a water bottle with me but they provided a full metal pitcher and stack of Dixie cups to stay hydrated. It’s your room, no one can or will enter. You can wear a swimsuit if you wish but I decided to go commando. 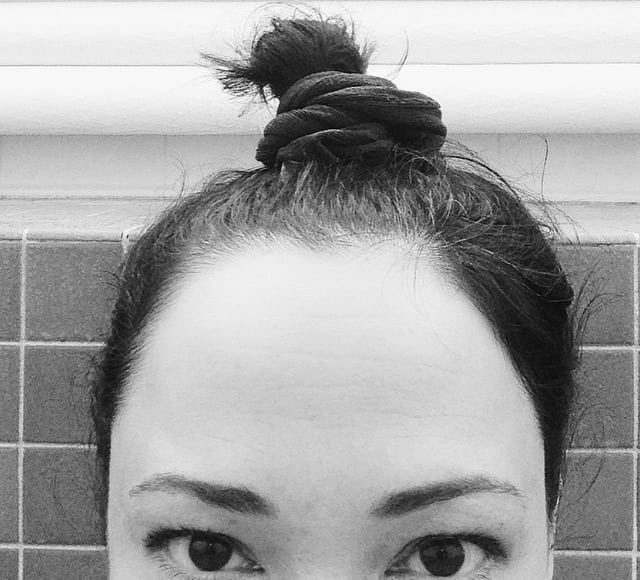 I pulled up my hair into a scrunchie, but once in the bath I realized the only way I’d get comfortable and relax is if I didn’t worry about my hair, my makeup, getting wet. Also, being right off the entryway I could hear every conversation going on as people checked in for their appointments and as they put back on their shoes to head out. The bath was a perfect size for me to be able to gently hold onto each side, lean my head back, let my ears fill with water and float. With my ears underwater all I could hear were the same sort of noises that others likely heard 50 years ago when visiting this same bath house – water being poured into tubs, water being drained. I let my legs do what they wished; as I breathed in and filled my stomach with air they would float up to the surface, when I exhaled they would sink and my toes would graze the tile bottom. I saw this as a meditative practice, an experience forcing myself to ignore the chatter around me and go inward. When I got hot, I’d sit up and it would take a minute before my ears would again notice the chatter outside my room. I’d drink water and stretch in the pool, kneeling in a horse stance, reaching out my arms and reveling in the power my right arm now has to push and pull. Once I was hydrated and my ears began to register other people’s voices, back under the water I’d go. I felt so free – 30 minutes of just me, myself, and I. I gently pushed my body forward until my feet hit the stairs, then floated back until my head touched the back wall. I focused on my breathing and when my mind would wander I’d bring it back. However, when the attendant knocked on my door to say time was up I was ready. 30 minutes in 102 degree water and a steamy closed room is pretty intense and my body was ready to get out. Tip: Don’t wear skinny jeans or fitted knits to the bath house. No matter how much you dry yourself with the two fluffy white towels they provide, you’re still getting dressed in a sauna. I struggled to get my leggings back on and wished I was in wide-legged chinos or a dress. I had left my shoes and socks outside my door, and sat on one of the wicker couches in the entryway to wriggle them on. I then stepped outside to meet my friends. It was only 25 degrees that day, snow on the ground, yet we were steaming in our tee shirts for a good 15 minutes before we could even consider putting on additional layers. We then took our water bottle to the spigot to fill them with fresh Berkeley Springs water and checked in at the hotel. Once settled, we headed to our next activity – treatments at Atasia Spa. Just a block from the bath houses and our hotel, Atasia Spa is built into an old home and has plenty of charm. Justin manned the front desk and was charming and friendly. 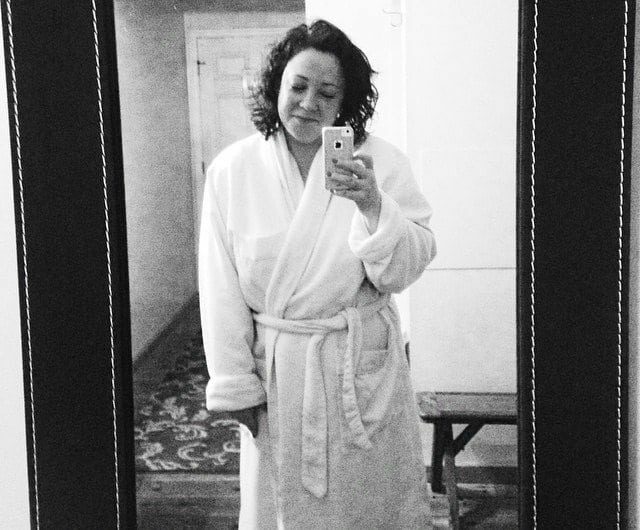 While my sister went to have a pedicure, my friend and I were led to the locker room to change into robes so we could go upstairs for our facials. Other than my bi-weekly manicures, all my pampering is DIY so a facial is such a luxurious indulgence. My appointment was for the rejuvenating facial, and Lisa was my esthetician. Lisa was fantastic – she asked if I had an issues, we briefly commiserated on our age, she wrapped a headband around me, I closed my eyes and she got to work. I’ve only had two other facials in my life and this one blew those two out of the water. It wasn’t just a facial but a relaxation session, where she massaged my arms and hands (and put my hands in plastic bags with warm mitts over them) and my feet (they also got the plastic bag/warm mitt treatment) and massaged and treated my neck, shoulders, and décolleté. She didn’t speak (except when I got a coughing fit and she got me water and offered me a mint), I was able to close my eyes and drift off as I was steamed, cleaned, scrubbed, masked, and lotioned with delicately scented products. At the end, Lisa suggested a whitening product from Robanda that can be found at TJ Maxx to try on my age spot; she too had similar discoloration from overuse of tanning beds and after two weeks her dark spots were gone. I plan on going to TJ Maxx this weekend to see if I can find a jar! After our time at Atasia and the bath house, we were all relaxed and smelling like lavender, our hair all crazy and our faces bare. We decided to spend the entire weekend makeup-free. Nothing like bringing in my 40th with a completely bare face! This is why we decided to do all photos for the weekend in black and white. I even brought a camera thinking I'd capture lovely pictures of the weekend for a blog post but never took it out; gotta admit it's hard to be in the moment when experiencing life from behind a lens. I took a few iPhone photos and shared them on Instagram, but in return I ended up with many more concrete memories. We went back to the hotel to freshen up and settle in, then went to check out the tiny town. We went into a few shops (I got two green cocktail glasses at the indoor flea market), stopped by a bar for a drink and a snack, and since it was January and a lot of places were closed ended up at a Mexican restaurant where we had dinner, many margaritas, and many laughs. We headed back to the hotel and had a cocktail at its bar, and then headed back to our room where we chatted for a long while but were still in bed by midnight. It’s funny how at 30 an “early” bedtime would seem tragic but at 40 it seemed so decadent – staying up later than usual PLUS being able to sleep as long as I wished! But in typical fashion no matter my bedtime my body woke up before the sun, so I slipped on workout clothes and went to find the hotel’s exercise room. I couldn’t figure out where it was nor any other people awake so I roamed around the main building of the hotel, learning more about it and the town’s history. Grabbed the latest issue of People and a cup of coffee and snuggled into one of the armchairs in the lobby until I got drowsy. I went back to the room and slept another hour until my friends also got up. 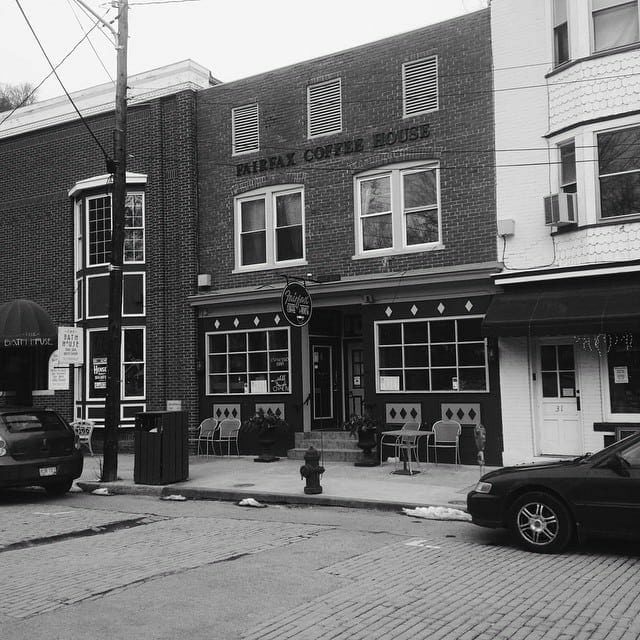 We stopped by Fairfax Coffee House for java and a quick breakfast and then back to Atasia Spa where we three booked 90-minute massages. My masseuse was Shaun, who was very nice and asked if I had any issues. I said I had none, then remembered I had a bone stimulator machine in my right forearm that hurts if you press on it. It was thrilling to be able to say there was nothing wrong with me; not only the arm but I’ve had a couple years of back issues, shoulder issues, neck pain but right now… nothing outside of not pressing on the weird battery pack in my arm that thank goodness will be gone this summer. She left the room, I took off my robe and got settled on the table. A 90-minute massage is total decadence. I’ve had a few massages before but never one for so long or one that got me so relaxed. But as with my time at the Roman baths, I was letting external distractions get to me. It was again a practice in quieting my mind and staying focused. I’d notice a weird part of a song playing, the volunteer fire department alarm went off, I heard another client laugh in the hallway. But I kept working on bringing myself back, letting myself relax and be in the moment. I don’t get moments like this often to be disconnected, to be pampered, and to be relaxed and was glad I forced myself to enjoy it and experience it fully. Shaun did a great job; she asked how firm or light I wanted it and applied the perfect amount of pressure, didn’t talk during the session, and left my body a puddle of relaxation. After our massages we floated a bit around Berkeley Springs looking in a few more shops, but decided to get on the road. We stopped in nearby Hancock, Maryland for brunch at Buddy Lou’s, a charming place of antiques, food, and drink. But soon we were back on the road and got home in plenty of time to watch the Superbowl. I can’t think of a better quick getaway and can’t think of better people to get away with. Berkeley Springs is a cute town; I’d like to go back this spring with Karl and Emerson as I think they would love it! Aw looks like a fabulous time! This is how I want to celebrate my 30th lol it’s coming in August and friends want to “go all out” and I’m like meh. Can’t we keep it simple?! Sounds like a great place to visit. I would love to try the bath house. Sounds like it was a lovely getaway. Awhile back I treated myself to a weekend a Nemocolin and enjoyed a few spa treatments. I’ve been wanting to do it again but haven’t done so because of the distance and expense. How fun! I’d love to try a bath house! It was lovely to hear about your fantastic little getaway! It sounds perfect. Thanks for giving us the vicarious pleasure of your experiences. Very low key as the place shuts down pretty early. However when the weather is better I think the town has more action. There’s a lot of different spas to choose from, some nice restaurants (a blog friend’s cousin owns Lot 12 which we wanted to go to but it was closed the weekend we were there) but a good place if you want to connect with your friends in place of strangers. They also have a Girlfriends weekend in June http://www.berkeleysprings.com/hey-girlfriend geared towards friends getaways and bachelorettes. Hope that helps!